It has been an eventful week for Volkswagen Chattanooga and for VW's subsidiary Lamborghini. It has been a week full of milestones for Volkswagen and one of its subsidiaries. First, the automaker has just celebrated the 10th anniversary of the Chattanooga Manufacturing plant. And, then there have been significant milestones for Lamborghini. This week marked the 10th anniversary of the day that civic and government officials gathered with VW officials to announce the decision to build an auto assembly facility in Chattanooga, Tenn. The decision resulted in an initial investment of $1 billion, as well as a commitment to hire 2,000 employees (team members). Since the initial decision a decade ago, investment has grown by more than $2.3 billion. It has also resulted in 3,500 jobs and the assembly of nearly 800,000 vehicles. Antonio Pinto, president, and CEO of VW Chattanooga called the facility necessary to the overall strategy of VW. “Reaching this milestone has only been possible through the contributions of our 3,500 team members and the collaboration of the City of Chattanooga, Hamilton County and the state of Tennessee. We look forward to many more years filled with growth and progress. Volkswagen Chattanooga’s success is important to the overall strategy of the Volkswagen Group,” said Antonio Pinto, president, and CEO of Volkswagen Chattanooga. “Reaching this milestone has only been possible through the contributions of each of our 3500 team members and the collaboration with the City of Chattanooga, Hamilton County and the State of Tennessee. We look forward to many more years filled with growth and progress,” Pinto continued. Completed construction of the world’s first LEED Platinum certified automotive factory in Chattanooga. The first vehicle to roll off the assembly line was the award-winning American Passat. In 2014, the factory underwent a $900 million expansion for the all-new Volkswagen Atlas – named the Cars.com Best of 2018. Volkswagen also opened the North American Engineering and Planning Center in Chattanooga, adding more than 200 jobs. 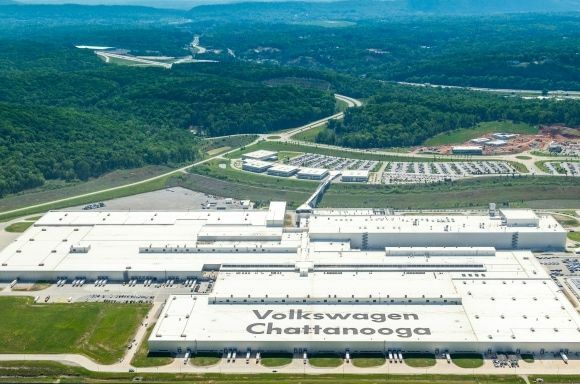 Volkswagen Chattanooga was named the assembly home of a new five-passenger SUV, representing an additional $340 million investment. Meantime, just seven years after its market introduction, the Aventador hit a significant milestone in its history. The automaker announced that it had made 8,000 units. According to manufacturer records, Chassis 8,000 was an Aventador S Roadster. The Aventador S Roadster was shipping to a customer in Japan. Overall, Lamborghini’s worldwide deliveries increased by 11 percent to 2,327 cars in the first half of 2018. Global sales of the Huracan model line, including the coupe, Spyder, and racecar versions, increased from 1,400 to 1,604 units. There were 673 Aventadors delivered in the same period.